In my previous article “The Biblical Roots of Christian Praise and Worship,” I dealt with the Tabernacle of Moses from which praise and worship in churches today had its origin. 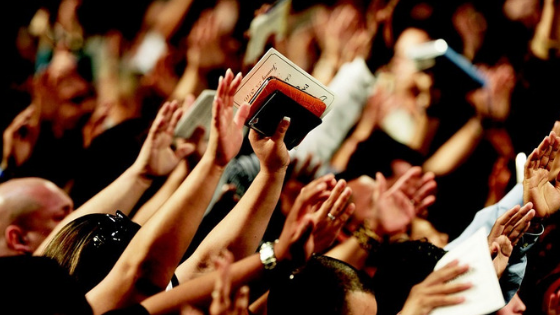 In this article, we will look at the how’s and why’s of praise and worship. Why and how should the people of God praise and worship the Lord? As a redeemed Christian, I am pretty sure you are familiar with the “praise and worship” part of the church service. Some even say it is their favorite part, aside from the sermon or message, of course. But how much do we really know about praise and worship? The book of Psalms is a good place to start, for it is all about praising and worshiping God. Unfortunately, I won’t be able to tackle all chapters that deal with this topic and compress them all into just one article. 1 Come, let us sing to the Lord! Let us shout joyfully to the Rock of our salvation. 2 Let us come to Him with thanksgiving. Let us sing psalms of praise to Him. 3 For the Lord is a great God, a great King above all gods. 4 He holds in his hands the depths of the earth and the mightiest mountains. 5 The sea belongs to Him, for He made it. His hands formed the dry land, too. 6 Come, let us worship and bow down. Let us kneel before the Lord our maker, 7 for He is our God. We are the people He watches over, the flock under His care. The Hebrew word “Yadah” translated “praise” means “to stretch out the hand.” That is, to hold out the hands in reverence, to open the hands and let go of everything. Alban Douglas made a very good point when he said (in his book 100 Bible Lessons) that if we hold the Lord in the highest state, respect or adoration, it would be easy for us to praise Him. That is because we only praise something or someone that we honor and regard so highly. a) Pruskuneo – meaning “to kiss (like a dog licking his master’s hand), to fawn or crouch to, to adore.” It occurs 59 times in the New Testament, carrying with it the idea of falling down to kiss the ground before a king or kiss their feet. Basically, praise means looking up, while worship means bowing down. Do you know that some people who enjoy lifting their hands and shouting do not enjoy bowing their knees and submitting? The psalmist tells us that our praise should be joyful and enthusiastic – he even commands us to sing and shout, and wholly focused on the Lord (Psalm 95:1). How do we worship the Lord? By bowing down and kneeling before Him (Psalm 95:6). Too often Christian praise is nothing but religious entertainment; it never moves into spiritual enrichment in the presence of the Lord. It is important to understand that praise and worship is not a show whose goal is to appeal to the flesh or natural part of man. The verb “come” (Psalm 95:2) means “to go to meet God face-to-face, and be in His presence.” Do we have a personal encounter with God during praise and worship? Or do we treat this part of church service only as a form of entertainment? A. We praise the Lord because He is great and above the false gods of this world (Psalm 95:3). The Scriptures are very clear God; we are to worship the Lord our God only (Luke 4:8; Psalm 45:11) and we are not to worship idols. God is a jealous God and does not want to share His glory with anyone (Exodus 20:5). No wonder that when God gave Moses the Ten Commandments, the command to not have any other god besides Him is first on the list (Exodus 20:2-3). Unfortunately, many people in the world worship idols of wood and stone, either out of ignorance or because they do not believe in the one true God – the God of the Bible. Many worship idols of self, money, business, possession, power, pleasure and family. Let us not forget how God punished the nations for ascribing worship and adoration to false gods. He even punished His chosen people, Israel, for repeatedly falling into the sin of idolatry as a result of living alongside these nations and intermarrying with them. We should delight in praising God because He is not only the Creator of the universe but He also controls all things. The depths of the sea and the earth, and the heights of the mountains all belong to Him. The Lord knows what is going on in the waters as well as on the earth (Psalm 95:4-5). *Note: Christians should not praise the Lord only in health and prosperity, but also in sickness and in adversity. We should praise the Lord in anything and everything (Philippians 4:6). Because the true Christian is one who can trust and praise the Lord even through blinding tears. B) We worship the Lord because He is our God; we are His people and He watches over us and cares for us (Psalm 95:7). In closing, let me just say that there are a lot more reasons why Christians should praise and worship the Lord. But in this age, when inventing clever new worship forms is a common practice and novelty is slowly replacing theology, the Word of God is a vital part of Christian worship. Hearing and heeding God’s word must be central if our worship, private or corporate, is to be truly Christian. And whether we worship at home or in the church is immaterial. What matters to God is our spiritual condition. Our goal in praise and worship is not only to sing songs of praise and adoration for God; we must come into His presence in total surrender so we can hear His voice and be able to tap into His power and anointing. What motivates you to praise and worship the Lord? How do you do it? Please let us know in the comments below. *Are you interested to take up Christian drum lessons? Join worship guitar class right here.